would be perfect if the fragance last more!!! I bought this fragrance after I purchased Love in Black which is my favorite of the two. Don't wear it as much as the Black version. Love in White is my absolute favorite scent!! It is my signature scent!!!! It's elegant, smells wonderful like nothing else & it definitely smells expensive. It stays on me all day, but I layer with the lotion, which I had to purchase at a high end retailer, but feel it was worth it. 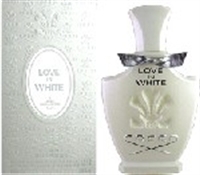 I have 6 scents on my perfume tray, but Creed Love in White is my favorite, my husband's too! !